My piano, which I’ve had for almost thirty years, has just come back from a six-month trip to be renovated by Steinway in London. Before you ask, I wasn’t without a piano for the whole of that time: they kindly lent me a very nice Steinway ‘B’ grand to tide me over. The main reason for the renovation was technical – to upgrade and renew various things inside the piano, and to replace the ivories, which had become old and thin, and were constantly breaking and coming off the key surfaces. Sometimes they splintered as I was playing, launching little shards of ivory at me with alarming velocity. As the piano would probably never be going to London again for this kind of renovation, it was suggested I could take the opportunity to have the casework restored while they were at it. The piano’s black wooden case had become quite damaged over the years – by sun bleaching the side of it, and by me foolishly keeping heavy pot plants on the lid without realising that moisture was seeping through to the wood. Truth be told, it had become the piano equivalent of a moth-eaten old teddy bear, loved by its owner but possibly not by anyone else. I decided to bite the bullet and have the casework restored using a high-tech process which coats the wood in multiple thin layers of black polyester. ‘To mark the club’s 75th birthday, current president Hugh Macdonald introduced a programme derived from a weekend in 1953 when Benjamin Britten, Peter Pears and the Amadeus Quartet played Haydn, Schumann and Vaughan Williams. 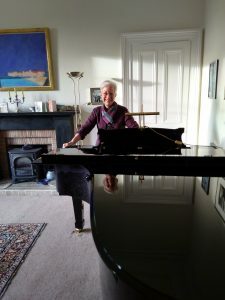 Back then I am sure that Milngavie would not have been able to look so close to home to find musicians of the calibre of pianist Susan Tomes, tenor Jamie MacDougall and the Maxwell Quartet – the latter hot-foot from winning the Trondheim International Chamber Music Competition. … Vaughan Williams’ song cycle ‘On Wenlock Edge’ was a first for both players and singer, although you would never have guessed it from the commanding performance.